Bouteloua curtipendula (Michx. ) Torr. Culms: Erect, solid, glabrous, purplish at nodes, arising in clumps or few together. Blades: Numerous, flat, 2-12 inches long, less than 1/5 inch wide, glabrous below, rough above; margins with hairs arising from tiny blister-like bumps, particularly near ligules. Sheaths: Usually shorter than internodes, finely ridged, glabrous below or soft-hairy near summit. Ligules: Fringed or notched membranes, short. Inflorescences: Panicles, 3-16 inches long; branches 12-60, 1/2 to 3/4 inch long, angled to 1 side of slightly zigzag rachis, flag-like. Spikelets: 3-8 per branch; florets 2 per spikelet, 1 perfect, 1 imperfect; glumes unequal; lemmas with 3 short, unequal awns. Habitat: Rocky hillsides and dry, open grassland, in fine-textured limestone or chalk soils. Forage Value: Side-oats grama is a high-quality and nutritious forage readily consumed by livestock. It makes good hay and tolerates drought well. Comments: Rhizomatous. "Side-oats" refers to the small, oat-like clusters of florets that hang uniformly on 1 side of the stem. 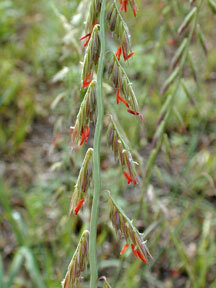 Side-oats grama is the state grass of Texas.